Hi there! I purchased new stamps last week and they finally arrived yesterday. I'm using one of them for this sketch challenge. Hope you like it! 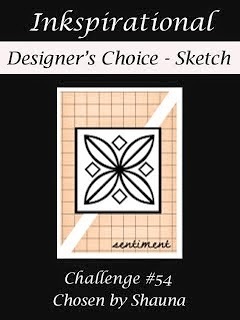 Click on the sketch below and it will bring you to the challenge site. I'm using a stamp set by Newton's Nook called Wagon of Wishes. I've embossed it with white powder and watercoloured the images with Distress Inks. As you will see, I did not follow the sketch directly but I was greatly inspired by this sketch. This is very cute! I like how the white embossing looks against the kraft. The simplicity of the design makes the colors really pop and the wagon stand out. Thanks for sharing with us at Inkspirational and for joining the DT call!